Take on the competition with the Brunswick TZone Ocean Reef. 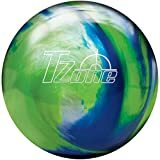 This fun plastic/spare ball not only looks good on the lanes but is perfect for beginners, straight bowlers, or pros looking for a spare ball. Be the first to comment on this.